-Two versions of this mod! colorful and colorless! *to install it first you will download the mod, after that, open/decompile the rar and open the folder of your preference (colorless or colorful). Copy the gfx folder and paste it into the resources folder of your game and done!! you got the mod! *please, if you detect some bug, report it, and we&apos;ll fix it! *we have more ideas for other bosses, if you have some idea, share with us! we&apos;ll probably add it! - Now there are all bosses images in the mod description! If you still alive, can you help me create a NEW boss for A+ (can be found only in Sheol (New Home (or in my mod - New Ruins) ) )? (It is Toriel (In Original - Asgore). 1. You from Country (i&apos;m not from Eng. Speaking Country too, i from Russia). 2. Okay, you can make sprite. Are You going to create more creatures like these? Hey, i&apos;m curently working on some Undertale monsters too, and I discovered your mod, I already got some work, wanna team up ? LETS GET THE HYPE TRAIN STARTED! AFTERBIRTH+ RELEASE DATE OFFICIALLY ANNOUNCED! Its been a while are there gonna be anymore updates? 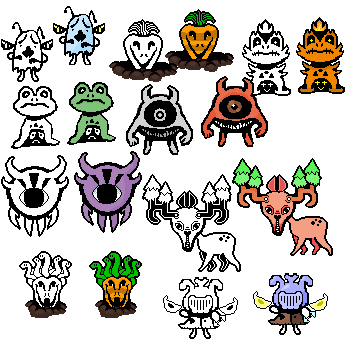 i have A lot of Ideas for Bosses, you can take bosses from Warhamm&apos;s Underswap Mod https://moddingofisaac.com/mod/2480/the-binding-of-underswap-neonic-101 there&apos;s a lot of new monster&apos;s! How you open .anm2 files? I want to create my own monsters. Idea: Gurdy Jr. = Moldsmal,Gurdy = Moldbyyg. its a great idea!, but gyftrot is gurdy, actually i&apos;ll try do a sub boss? Oh okay then also,here is another smol idea: Gish = Vulkin. No joke, I&apos;m SURE this is an amazing mod, but I wish there were more monsters available at release. Actually, I suggest you should add some of the characters as bosses. and I don&apos;t mean any fan characters like blueberry sans or someone like that. I mean like Undyne or mettaton. actually, Undyne its a great idea, i won&apos;t add mettaton because of the binding of undertale dlc. Undyne is actually why I&apos;m waiting to make my mod until Afterbirth+ comes out. I want her battle (and battles like it) to be a s unique as possible, and I&apos;ve heard that you can only do few things with mods right now. I could definitely help you when the time comes (provided I could have some practice at spriting her first). I heard AB+ is coming out REALLY soon, so I just want to be ready. Like it but... Gyftrot shoots way too fast. Probably because of the edited animation file.